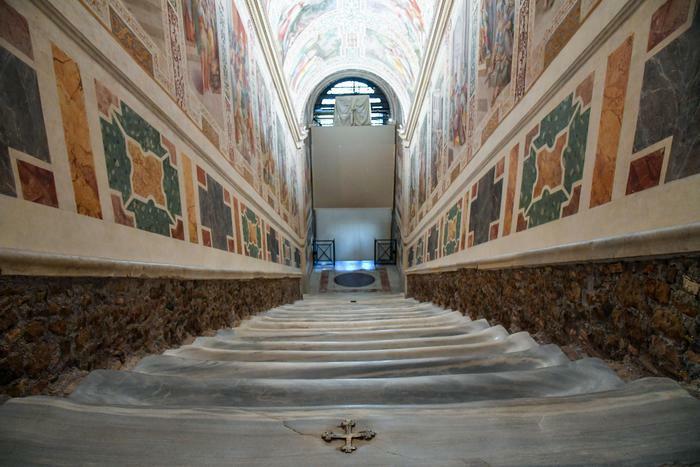 The Scala Santa, a staircase that Jesus supposedly once stood on, has reopened in Rome just in time for Holy Week. The steps – believed to be “stained with Christ’s blood” from the crucifixion – reopened to Christian pilgrims on Thursday, after 300 years of being closed off. Until Pentecost on June 9, visitors can climb the 28 steps that are said to be part of Pontius Pilate’s Jerusalem palace where Jesus was tried before being sentenced to crucifixion. There are three crosses along the stairs, believed to be the locations where Jesus fell and dropped blood. Legend has it that the stairs were brought to Rome by St Helena, Emperor Constantine’s mother, around 300 years after Christ’s death. During the Renaissance, they were installed in a sanctuary next to the Basilica di San Giovanni in Laterano, in south-eastern Rome, where they have remained ever since. The stairs have been covered with wooden slats since 1723 to protect them from being worn down further by millions of pilgrims. But on Thursday, the staircase reopened to the public for the first time in centuries in its original state. Visitors are permitted to climb it only on their hands and knees and with protective covers over their shoes. “If you close your eyes for a moment, you can imagine yourself back in the medieval era, the last time that people scaled these steps on their knees,” Guido Cornini, a curator from the Vatican Museums, said. Experts have also worked to restore the 16th-century frescoes that line the staircase to their original glory, as well as the Holy of Holies sanctuary they lead to, which is home to some of the Roman Catholic Church’s most sacred relics.